New house construction in partnership with the Horn Family; sponsored by Presbytery of Sheppards and Lapsley. 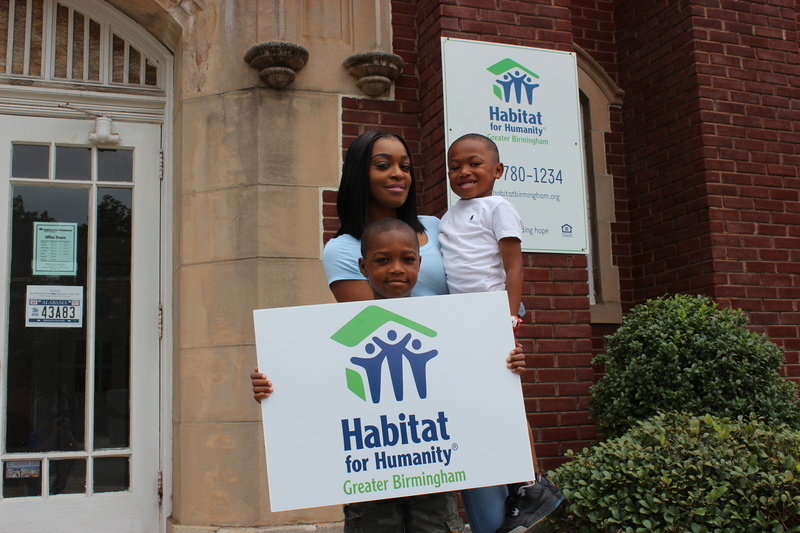 Volunteers can schedule an opportunity to participate in house construction every Thursday, Friday & Saturday from 8:00 am to 3:00 pm. Volunteers must be a minimum of 14 years old to be on the construction site. No construction experience necessary. Habitat reserves the right to remove any volunteer from the work site if, in the opinion of a Habitat staff member, the volunteer acts in a manner that creates risk of injury or harm to that volunteer or others. Jamesia was born and raised in Bessemer. She graduated from high school in Bessemer and attends Lawson State Community College where she’s studying to become a Dental Assistant. She works at Children’s Hospital as a Patient Representative. She has two children, Ja’Kaiden and Timothy. Ja’Kaiden is 7 years old and enjoys participating in sports. Timothy is 3 years old and loves to attend football games on the weekends. The family attends United Apostolic Church of God.